MIAMI — Cole Hamels is in a zone. The Phillies left-hander, who is still fresh off inking a six-year extension, showed his worth in another shut out performance in a 4-0 win over the Marlins. 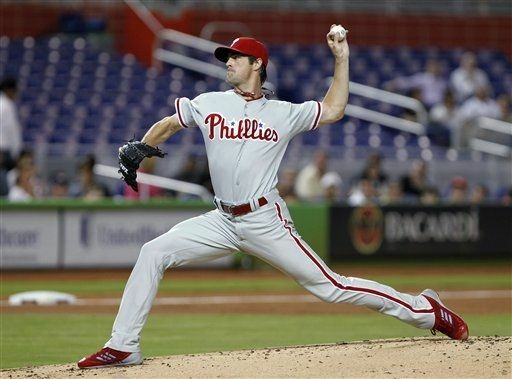 Hamels was nearly unhittable, allowing seven hits and a walk while striking out five. He threw 113 pitches, an astounding 85 for strikes. He expanded his shut out streak to 22 innings. Hamels kept the Marlins hitters at bay, who didn’t have an answer for the Phillies offense tonight. An RBI double by Chase Utley got things rolling in the 3rd inning. Juan Pierre scored later in the inning on an error by Miami third baseman Greg Dobbs to make it 2-0. The Phils scored twice more in the game. In the 4th, Pierre hit an RBI triple to make it 3-0 and then Erik Kratz’s sacrifice fly in the 7th made it a 4-0 game. 2B: Utley (5), Mayberry (17). 3B: Pierre (5).